Lisa Jo Baker's Five Minute Friday brings together writers who are encouraged to just spend five minutes writing on a one word prompt. Today's prompt: Mercy. I am bending the rules today. It is difficult to spend just five minutes on mercy/compassion in Buddhism and come away with a sense of understanding how compassion fits into Buddhist practice. 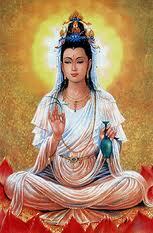 Some Buddhists revere Quan-Yin as the ultimate representation of mercy in Buddhism. There are those who see her as a goddess, and those, like myself, who prefer to see her instead as a Bodhisattva. * She is often referred to as "she who hears the cries of the world". 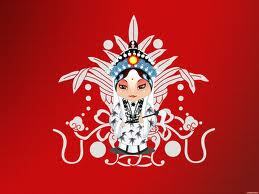 In my eyes, Quan-Yin is a symbol of compassion and mercy rather than a deity to be worshipped. Legend has it that Bodhisattva Quan-Yin vowed not to rest until all beings had been freed from samsara, the process of continuous birth, death and reincarnation, and was gifted with the ability to hear the cries of humanity to offer them assistance. : a feeling of wanting to help someone who is sick, hungry, in trouble, etc. Personally, I prefer the word compassion rather than mercy. Why? To me the word mercy is one that places the 'merciful one' in a position of superiority over the one receiving of mercy. Compassion has none of that power attached to it, in my mind. Compassion is an understanding of the suffering of others without the "there but for the grace of go I". It is the understanding that the people around us are mirrors of ourselves. In Buddhism, the word compassion takes the place of the word mercy. The sanskrit word for compassion is karuna, denoting a more active form of compassion rather than just a mere feeling of wanting to help someone. Compassion, in Buddhism, is not limited to empathy and it is not pity either. When we pity someone, we place ourselves in a superior, judgemental position, "Look at that poor person over there." It's external. Compassion is recognising ourselves in that person and honouring and respecting their journey in life. Compassion does not mean coming to the rescue, though. One of the lessons I learned about compassion is that sometimes being compassionate means allowing another person's life lessons to unfold. An example: you always bail out a friend who mismanages their finances. You think you're being compassionate, but you are actually depriving this friend of learning ot managed their finances better every time you bail them out. It may seem odd, but the most compassionate thing to do for this friend is to allow them to work through their financial karma and learn how to be more financially stable. How does one become more compassionate? It begins with nurturing compassion for oneself. Loving ourselves is one of the hardest things we can do. Love and compassion for others begins with love and compassion for ourselves. It comes with practice and meditation, but it does come. It is difficult to show compassion and love for others if we are not feeling it towards ourselves. The Christians believe that one should "Love thy neighbour as one loves oneself". This lesson is universal. When we live with hate in ourselves, we will only see hate in others and act in hate towards them. Compassion in daily life, for me, revolves around understanding that the woman on the other end of the telephone may have had a bad day, which is why she sounds rude and abrupt, and that her manner is not all about me. It is understanding that others experience pain and suffering and this colours the way they are in the world, whether that touches me positively or negatively. There is a Buddha in each of us. When a Buddhist greets you with, "Namaste", they are really saying, "The Buddha in me acknowledges the Buddha in you". Beyond our physical appearances and our life dramas and situations, ultimately, we are all Buddhas. It's difficult to see because we are all tempered by our upbringing, beliefs, experiences, life situation, chemical imbalances, psychological make up. Strip those things away, and we are all beings of light. Your discussion was really interesting to read. And it was good to learn the true meaning of the word Namaste as I have heard it used but never really understood what it stands for. I know a Serbian Orthodox bishop who translates both mercy and compassion as "co-suffering love". Your post resonates that concept for me. Thank you for taking the time to expand the discussion! Stopping by from FMF. Interesting, that idea of co-suffering love. I should go look that up. I grew up very conservative and legalistic, and, unfortunately, loving others was not something that was emphasized. It was much more the judging, I'm-right-you're-wrong, mentality. I hate that I wasted years of my life believing and living that. Finding balance has been a journey for me and my husband...we are thankful to have found that place and a church that lines up more with where we stand. To me, loving my neighbor as myself means loving them where they are. I don't have to agree, but I can still respect and love them and be thankful for what they add to my life. I'm glad you're part of my community, friend...and I'm so glad you linked up again. Thank you for sharing your thoughts! I agree that loving people where there are is where you have to be. Not easy when you sometimes want to yank them away from the destruction they are creating in their lives or where they are is a place of absolute darkness. I only started understanding "Love your neighbour as you love yourself" when I converted to Buddhism. What is in your “on the go” make up bag?